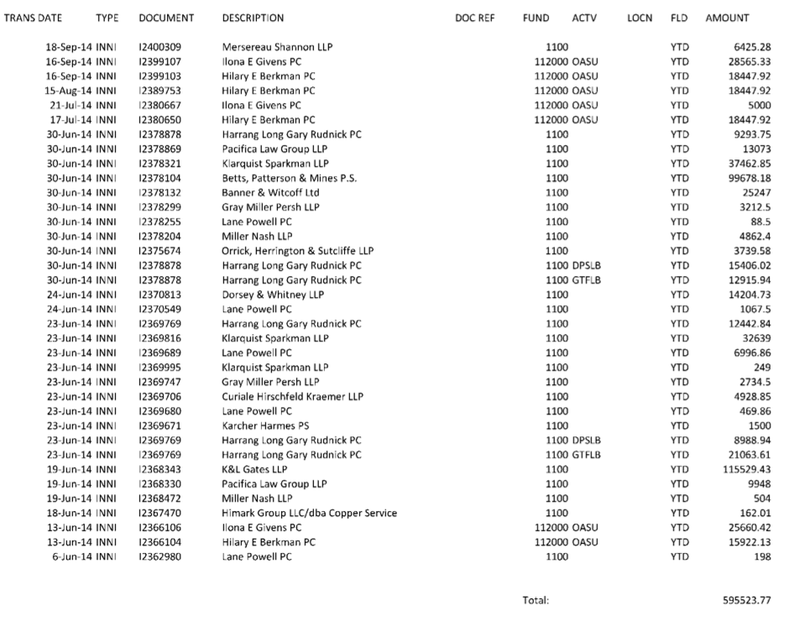 UO’s chief lawyer Doug Park accused me of harassment, because I cced him on an email asking the PR Office what the hold up was releasing these accounting statements, showing UO’s legal and consulting expenditures. So last week I filed a petition with the Lane County DA, asking her to order UO to release the docs. Park then wrote a long letter of complaint to the DA, accusing me of asking too many questions, and saying that these docs, which take a few minutes to run, wouldn’t be ready until October. Actually, he pretended that UO Public Records Officer Lisa Thornton had written the letter. Really? Man up Doug. Anyway, Ms Thornton’s PR Office sent the banner reports today, no charge. 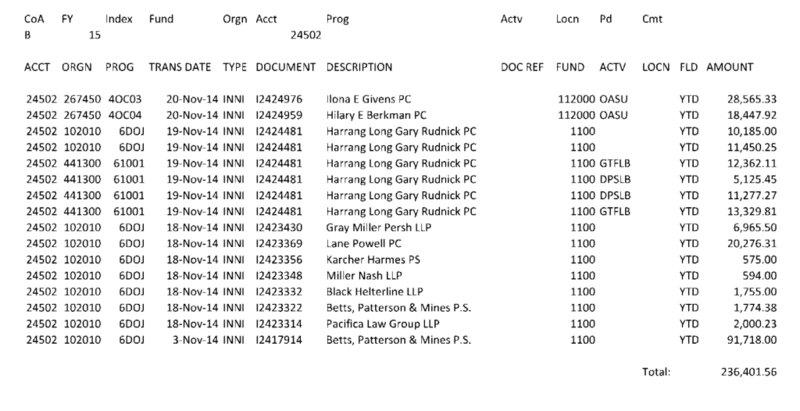 UO has spent ~$1.4M on consultants since Jan 1 2013, and ~$600K on outside legal help since June 1 2014. ($120K of that is for the lawyers ASUO hires to help students in trouble). Full file here. Tagged Doug Park, GTFs, Huron, Sharon Rudnick. Bookmark the permalink. 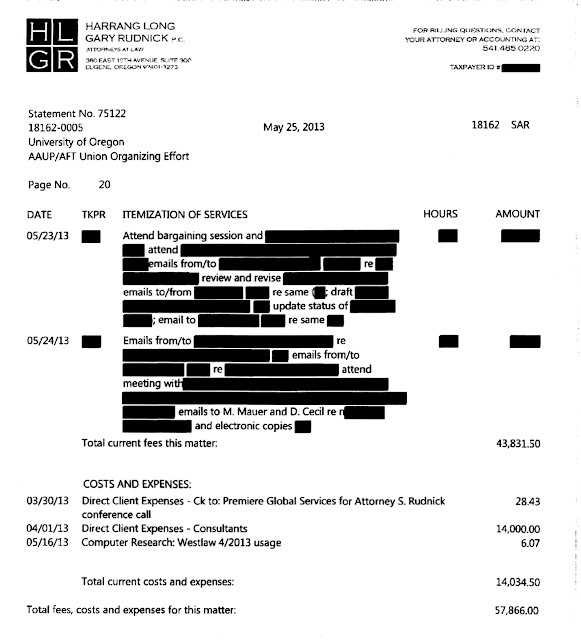 19 Responses to How much has UO spent on lawyers to fight our grad students? Please recognize when your behavior before the State will reflect poorly on the institution and respond accordingly. I believe there is sufficient evidence to reasonably conclude that your predecessor was seen as a fool; a reputation you can break free from by taken steps to distance yourself and your office from his losing game. You don’t know how legal hiring and billing works. Would you be willing to stop making misleading posts on things you do not understand? Spell it out for us, Steve. The fact that a firm isn’t on an accounts payable for a client for a particular month doesn’t mean that that firm hasn’t done work for that client in that month. Furthermore, the fact that a firm hasn’t done work for a client for a particular month doesn’t mean that that client has fired that firm. Sorry, I thought you actually knew something. My mistake. Go away. Do you have full PDFs of these reports? It’d be pretty fun to add up all of the lines that list “GTFLB” under the “ACTV” column. I think we can make some good bets about what that’s paying for, and I bet the total for the year is more than the difference between the GTFF strike platform and the latest administration offer! I’d share them with you, in exchange for a suitable emolument. Or you could just email Dave Hubin, at , and ask him to fork over these public records without further delay. Going back through the records from November, adding up the totals in each line listed as GTFLB is around $120,000. BUT, I don’t think that is actually what was spent. The 2nd column from the right lists all totals as YTD, which I’m assuming is year-to-date. I think these are running totals, rater than individual payments. I’m also lead to believe this as the numbers always get bigger as time goes on. There aren’t smaller payments of a few thousand sprinkled in, it always grows. With the exception, that it looks like there are 3 different totals that are growing and all labeled GTFLB. Maybe these are payments for at-the-table bargaining, research/consulting outside the table, and separate mediation costs? For example, the picture from the September post has 2 values listed as $21063 and $12915. Then the new information from this month lists $13995 and $7186. I think the $13995 is a continuation of the listing from $12915 from september, while $7186 is probably a new line (for mediation?). I suspect the $21881 in the new information (not listed as GTFLB, but still going to HLGR) is a continuation of the $21063. If this is correct, the total is around $42,000. So, somewhere between about $42,000 and $120,000. No, each number is a new transaction, not cumulative. I’ll post the raw files shortly. It’s big money. Damn. That’s even more frustrating. This is appalling. I seem to remember that UO spent over half a million in legal fees against Monica Emeldi, who wanted to settle for $300,000 (or an honest shot at a PhD). That makes two recent data points where the administration decided to spend far more on legal fees trying to screw grad students than the grad students were asking for. Does anyone know of other data points? Is the university just as gung ho about beating down faculty or staff with their lawyers, or is this special treatment reserved for uppity grad students? Yes, the University administration has also hired Harrang Long to beat down faculty and staff. They are willing to overspend on the chance they can avoid setting precedents. On certain labor issues though it seems that Harrang Long doesn’t have much expertise, and is learning quite literally at our expense. I suppose the administrators might be forgiven for thinking an expensive lawyer is always the best lawyer for any given situation. The word is they are getting phased out, dropped like the City of Eugene did to them. What precedents? Can you be more specific? There are plenty of examples, and the ones that didn’t settle are public information. Faculty are in arbitration right now if you want an easy one. The money flows freely when the JH admin are trying to cover up the results of their incompetence. Clean house and hire competent people in JH, EOAA, Purchasing, (just about everywhere actually) and money will suddenly appear for the academic side. Arbitration? Over what? Sorry to be so clueless. 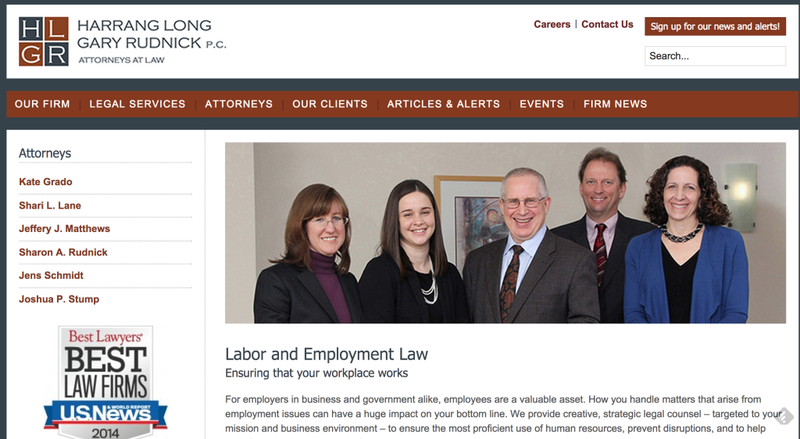 “$600K on outside legal help since June 1 2014”? Probably a lot of academic units run on less than that. Maybe you shouldn’t “post the raw files shortly.” Collective heart failure will result.